AVAILABLE IN SIZE XS, S, M OR XL! Your order will be processed with the size requested. Pro Team Long Sleeve Thermal Jersey. A cold-weather training jersey for riders and racers looking to stay aero without freezing. The combination of warmth and racing performance is tough to achieve, because insulation usually results in a bulkier garment. The Pro Team Long Sleeve Thermal Jersey is both fast and warm. The jersey fabric is a slightly thicker version of the current Pro Team Long Sleeve Aero Jersey, and has a fleecy brushed back inner for on-skin comfort. The jersey is cut in our Race fit, and it should be reasonably tight to ensure nothing flaps in the wind and slows you down. Further speed advantages come in the form of bonded back shoulder seams, with none at all on the front, as well as a new rear pocket construction that lies completely flat when not filled youll cut straight through the wind. Designed for winter training when skies darken earlier, there are reflective elements all over the jersey, as well as headphone loops, and an easy-use Vizlon zip. Made of a high-stretch and breathable performance fabric. Inner has been brushed back for soft comfort onto skin. Reflective armband and bars on wrist and rear pocket. Full length, easy-up VISLON® zipper for easy, one-handed adjustment. New triple rear cargo pocket (with breathable mesh inner) sits flat on back when not in use. Headphone loops up the back seam. 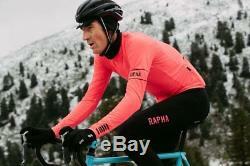 The item "Rapha Men's Cycling Jersey XS S M XL Pro Team Long Sleeve Thermal Pink RCC NEW" is in sale since Sunday, January 20, 2019. 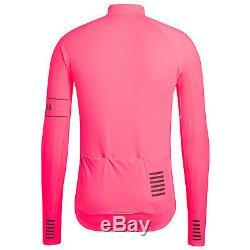 This item is in the category "Sporting Goods\Cycling\Cycling Clothing\Jerseys".